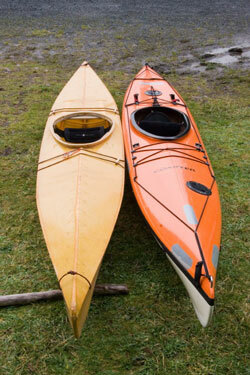 The perfect flatwater kayak for beginners. The perfect ocean kayak for surf enthusiasts. The original Coaster was designed by Cam Broze of Mariner Kayaks in 1985. This 23" wide 13'5" kayak quickly gained cult status as a superior kayak in the surf. 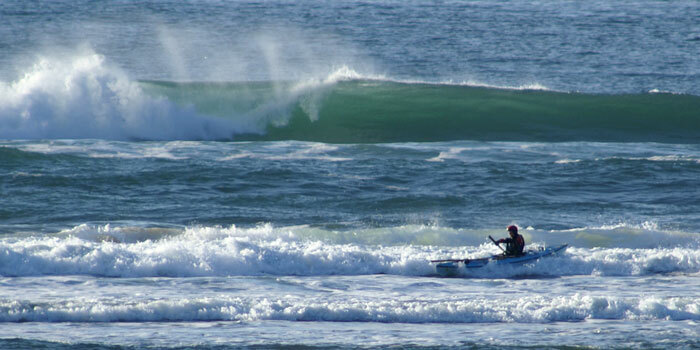 Surprisingly it went on to prove itself as a remarkably versatile sea kayak for smaller paddlers as well. Whereas the Coaster won’t win a sprint against a longer narrower kayak it is very fast for its length, it draws no penalty at cruising speeds and is actually more efficient than much longer kayaks at speeds up to 4mph because of its reduced wetted surface. Every sea kayak is a compromise but the Coaster seems to get away with a bit more than it's fair share. Some sprint speed in exchange for better cruising efficiency, maneuverability, portability, and large usable cargo space, a pretty good trade. This kayak is very stable, swift, turns especially quickly yet tracks well even in difficult cross-wind and following sea conditions. And it screams in the surf zone without pearling. 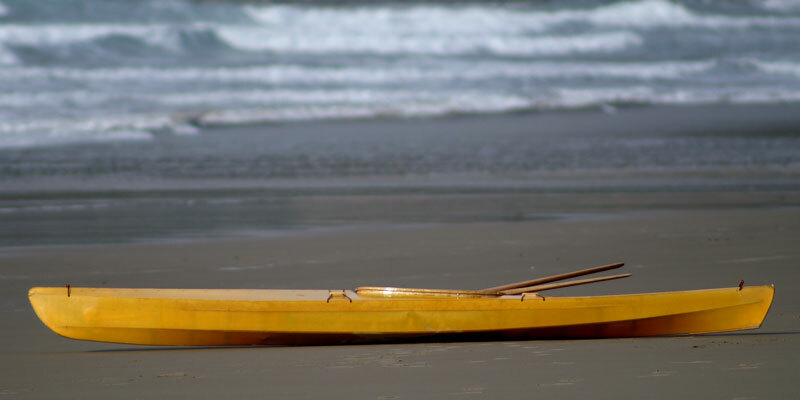 A great boat for kamikaze surfing AND peaceful flat water exploring. After the success of my own Mariner Elan inspired Ginnyak, I wanted to sink my teeth into a Coaster. I didn't want to reinvent the Coaster though; I wanted a skin kayak built as close as possible to the Coaster. So I obtained permission from Matt Broze of Mariner Kayaks to try to replicate the Coaster in skin-on-frame construction. My next challenge was to find one to copy. Coasters have been unavailable for two years and owners guard them zealously. A used Coaster will still sell for the price it was when new. Thanks to Dave Graham for loaning me the Coaster I tested and copied. I tested the original kayak in every possible sea condition until my arms wanted to fall off. The primary stability was a bit much for my tastes, and I can't stand the slapping noises of any fiberglass kayak, but I knew that building it in skin-on-frame should automatically solve these minor problems. A brief word on names, Coaster is a registered trademark of Mariner kayaks. While I can build a similar kayak I can't appropriate the name. However, names can't just be arbitrarily assigned, they have to be earned and I want to make sure that this kayak gets the right name so it make take some time. For the remainder of this article and on the website I'll refer to the Coaster copy as the SC-1 (skin coaster one). Also, Mariner does not endorse, approve, or associate with my kayak in any way. It is not my intention capitalize on their reputation. 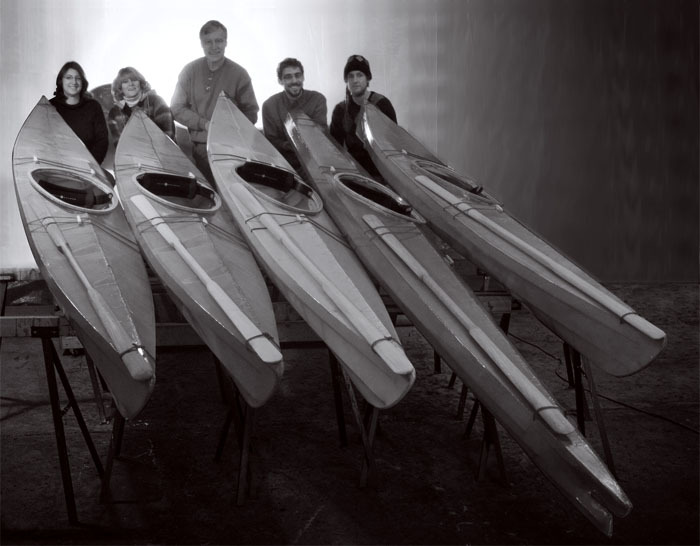 If and when Mariner liscences production of their fiberglass designs again, I'll reccomend them to paddlers who would be better served by a glass boat. There are compelling reasons to paddle glass, just as there are compelling reasons to paddle plastic, skin, or buy a motor boat. I've heard that Mariner is taking limited orders from Oregon, Washington, and Northern California. I'd buy one personally but it seems like I'm always losing boats off the top of the car and glass boats don't bounce down the freeway nearly as good as skin-on-frame. note: the real Coaster looks way cooler, but the SC-1 is a bare hull, ready for perimeter lines and hatches. What do you get from a glass boat? Storage space, longevity, (a skin boat will not last 30 years!) puncture resistance. 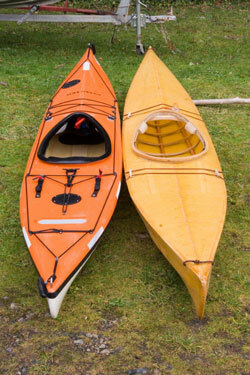 A skin-on-frame kayak is ultra light, has better impact resistance, less slapping noises. It's not a contest. I decided to take a unique approach to prototyping the SC-1; I invited a student to build the first prototypes with me as a class. My risky reasoning was that with a deadline and the responsibility for the students' kayak I would be a lot more motivated to 'get it right'. This was new territory for me. After building a dozen kayaks from historical drawings I immediately realized the difference of the challenge of rebuilding an existing kayak. I knew how this kayak was supposed to paddle, and I would know if I got it wrong. Also I wouldn't be able to replicate the Coaster exactly so I had to distill the key elements of the design and apply them to skin technology. The Coaster is not an easy shape to copy; it includes a variety of cross sectional shapes over its length (where most hulls are simply smooth variations of their midship section shape tapered out to each end). There are deep and shallow V'd sections and a host of other nuances that are critical to the design that would be so easy to 'fair out', ruining the kayak. The process was exhausting and stressful but when the week was done I launched the SC-1, still sticky, into a thick Pacific swell. In short, the design worked. It's a little different but still very much like the Coaster. When you press the chine it still turns in any wind. It doesn't rise quite as high in a foam pile and the net result of that was that I got a thin sheet of water over the bow when punching some very large waves, this is easily fixable and is due to a deliberate deviation from the lines of the original. It still has the net effect of climbing over huge foam and not spearing into it. Technical changes to the boat from the original are. 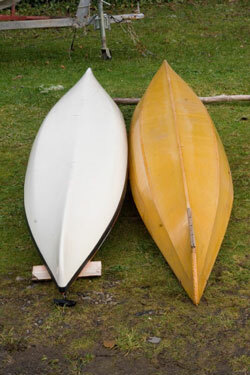 A 3/4" lower bow, 3/8" lower depth, a 3/4" upsweep in the extreme stern, less of a boxy section at the gunwale, a bit less of a shovel nose at the bow, 4 inches more length, different stem and stern shapes. I may made these changes based on hunches and I'll be varying the recipe a little bit with each new model. A slightly lower volume. I dropped the depth of the kayak 3/8" to suit my personal needs. The original Coaster can carry a 400 lb payload. The skin on frame version won't hold the same cargo load so it doesn't need the same reserve buoyancy concentrated at the gunwale. A ridged front deck. Again it drops the volume and the reserve buoyancy a bit. I like the aesthetic. My own deck line setup. Years of fishing, kiting, and touring in rough water have made me very particular about what I like for deck lines. I use latigo leather because it is simultaneously elastic but still strong enough to tow or carry by. Toggles allow tightening. My version of this boat is hardly better, but different. I'd guess I get some turbulent losses from the harder chines and concave surfaces, probably something like three percent. I might get that three percent back in displacement with less wetted surface from less weight. Then again I might loose it due to flex, I don't know, I'm not a naval architect. My boat will carry maybe 2/3 the load of the original but considering the original held everything but the kitchen sink I still feel flush with all the room. 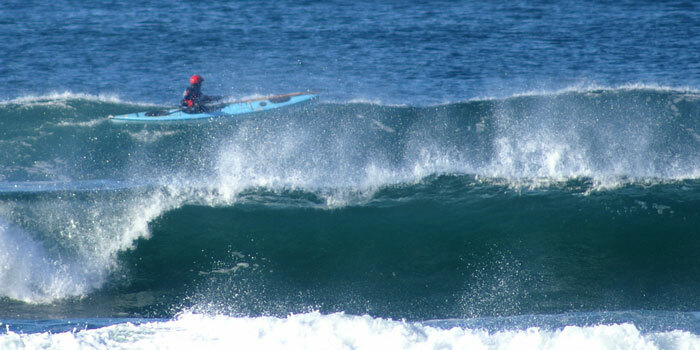 An interesting effect I discovered was that the surf beatings were noticeably less shocking in the skin version, with the flex of the kayak absorbing some of the wave energy. And like all my skin boats, it's half to two thirds of the weight of a glass boat, and quieter on the water. 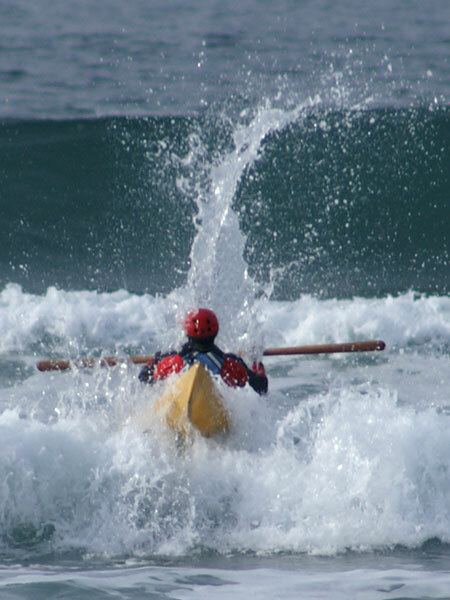 In the final analysis what makes a sea kayak a success is how easy it is to use and how much fun it is. 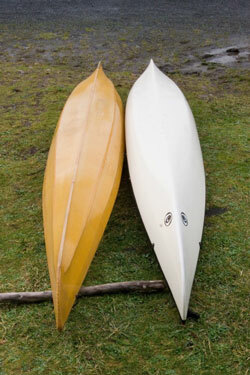 I tend to design for specificity so it's surprising for me to like a versatile kayak so much. The only 'camping kayak' I've ever enjoyed as a day-tripper. This kayak will replace my Ginnyak design this year, not because I still don't love the Ginnyak, my low volume hybrid, but because I only can work on one new design at a time. Ginnyak is slated for redesign anyways. The SC-1 will climb through a huge foam pile but there is still such a thing as being in the wrong place at the wrong time. The very first SC-1 class finishes on a cold wet January day. These are some seriously committed students. And then there's Douglas who just had to build a Baidarka. Honestly, the Baidarka is a great boat and it looks so much cooler than than the SC-1. But for me, this year, it still all about the SC-1! Getting the shape right. Reworking a cult classic kayak is a huge risk to my reputation and my business. If the boats don't paddle right "real" Coaster owners will rake me over the coals and this design will perish. Me giving Douglas's baidarka a test run. NEW: unedited email correspondance with students. This is the link to how the boats are REALLY performing.